$200 includes shipping in the Continental U.S. Shipping outside the U.S. is an additional $25.00..
See my daily art blog that features my location sketches (and my other Pop Art). I am an active member of the Boston Urban Sketchers group and I have been doing on-location art and sketching for most of my career as an award-wining artist, designer and painter. 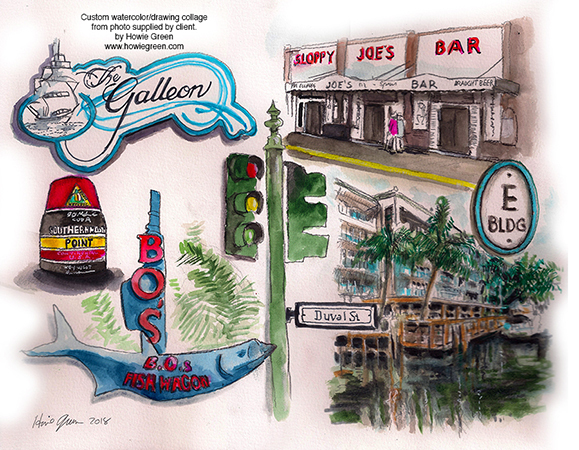 A customer wanted a unique gift for his wife so he sent me some of their vacation photos and I created the artwork above so they could have a special way to remember their trip to Key West, Florida. I can create a unique, one-of-a-kind original piece of sketch art for you based on your photos. It's a great way to capture memories in a unique and memorable way... And, they make great gifts! 11x14" on acid-free, heavy watercolor paper. Watercolor and mixed media. Up to 6 images. Comes with signed and dated Certificate of Authenticity. To get started... or if you need more information or have question please contact me.